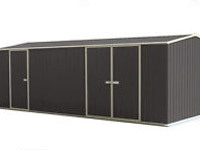 PREMIER: All sizes come with a gable roof and one or two door configurations. It is popular mainly because it is very well priced and represents great value. REGENT: This model represents a higher quality finish than the Premier. The doors are on the gable end and the roof has a slight overhang to add to the overall appearance. 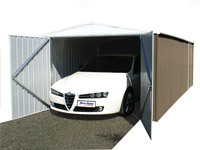 SPACESAVER: This model is ideal for those areas where space is limited. 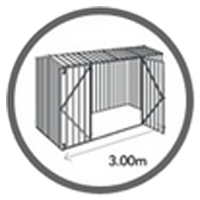 This model comes with a single or double hinged door based on the size. 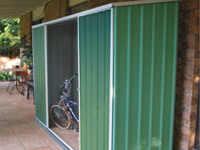 EZISLIDER: This is basically the Spacesaver shed but with sliding doors. It perfectly suits scenarios where place is limited and the door opening may not be practical. ECONOMY: Our "Budget" shed. It comes with a flat roof, and the height is only 1.8m. The door is set at the short end of the shed which is a big reason for its popularity. 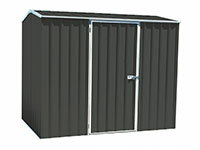 Highlander: This Shed is an extra high garden shed. With 2.035m highwalls and 2.3m high at the gable. 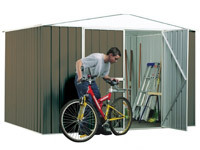 The Highlander Shed is ideal for the taller guy and serious handyman. 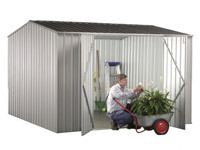 WORKSHOP: It is the ultimate garden shed / workshop for the hobbyist or a large storage area for the serious gardener or a home handyman. It comes with 2 or 3 doors (a double and a single door) and gabled roof. UTILITY: This model is what you need for your trailer, boat, car or anything you can thing of. Featuring extra large door opening in gable end, personal access side door with doors braced for strength and security, heavy duty reinforced central and front internal frames. 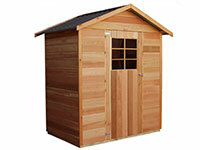 ECO: Basically the same shed as the Premier but with 10 year warranty instead of 30 year warranty. The process of making the steel uses less acids which is better for the environment. Comes in 3 Colorbond colours (Pale Eucalypt, Paperbark/Merino, Woodland Grey). TIMBER: Nothing beats the look, feel and smell of a Cedar / Timber Sheds. 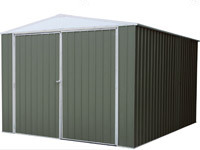 All our Timber Sheds are constructed with termite resistant frames and wood has excellent insulation properties. 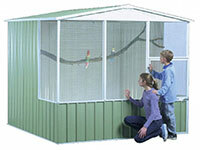 AVIARY: Aviary sheds are not limited to birds. Small animals like dogs, cats, and chickens are also suitable for our design. With the 30 year warranty, you never have to worry about investing in a new aviary shed and can rest assured that your animals will be safe and secure.